iOS 5 introduced iMessage, a new capability within your iOS device’s Messages app that can send text, picture, and video messages to other iPhones without counting against your carrier’s messaging plan. What’s more, iMessages actually works with any device running iOS 5, meaning iPad and iPod touch owners can get in on the messaging fun, too. When you enable Read Receipts, your contacts can see when you’ve read their iMessages. iMessage has the ability to indicate to you when your recipient has read your message. This option, called Read Receipts, is off by default. Out of the box, when you send iMessages, you can see the moment they’ve been delivered. But if your recipients turn on Read Receipts, you can see the moment that iMessage notes your delivered messages have been read. So do the iMessaging community a favor and turn on Read Receipts. Then get all your friends to, too. Here’s how: Launch the Settings app, then scroll down and tap on Messages. From there, slide Send Read Receipts into the On position. 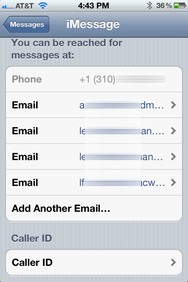 After you configure all your email addresses, set one as your iMessage Caller ID. That way, your messages can stay in sync between your iPhone and any other iOS devices you might own. Don’t quit the Settings app yet. While you’re there, scroll down to the awkwardly-named Receive At button and tap it. That’s where you can set all the email addresses you own at which you’d like to receive iMessages. If you have more than one email address (say, a work address and a personal one, or just multiple personal accounts), you can configure things so that iMessages sent to any of those addresses all point to you. Apple will ask you to confirm any email addresses you add; the company sends you an email, and you select the link inside to prove that you really own the address in question. This way, people with different email addresses for you can still reach out to you via iMessage, and all the messages you receive will go to the same place. Hold it right there. Your iPhone, I mean. Because just below the email addresses you just added in the Receive At settings is another option called Caller ID. You use it to dictate from whence it should appear that your iMessages are sent. On an iPhone, it can be your phone number, or any of the email addresses that you’ve linked to your iMessage account. My advice: Choose your main email address, instead of your phone number. That’s the ideal approach for anyone using an iPhone in tandem with another iOS device—like an iPad. Your iPad doesn’t have a phone number, and it can’t receive iMessages sent to your iPhone’s phone number. It can, however, show messages sent to (and from!) an iMessage-linked email address. So, by using an email address for your iMessage Caller ID, you can ensure that your messages are completely synced on all your iOS devices. And when you compose new iMessages to your friends, make sure to use their email addresses (and not their phone numbers) when possible; that’ll ensure that they too see their messages synced between their devices.